Last week, I heard a pair of Barred Owls hooting and carrying on across the lake. Occasionally, they fly over my house or perch in a nearby tree. After hearing them, I was hoping to see one so I prepared a camera just in case, and I was glad I did, because shortly after getting my camera set up, one of the owls perched in a nearby tree. Using a flash (Nikon SB900 with a Better Beamer), I was able to get the above shot. I have photographed the Barred Owls before, but this was the first time at night with the autumn colored leaves partially lit behind the owl. 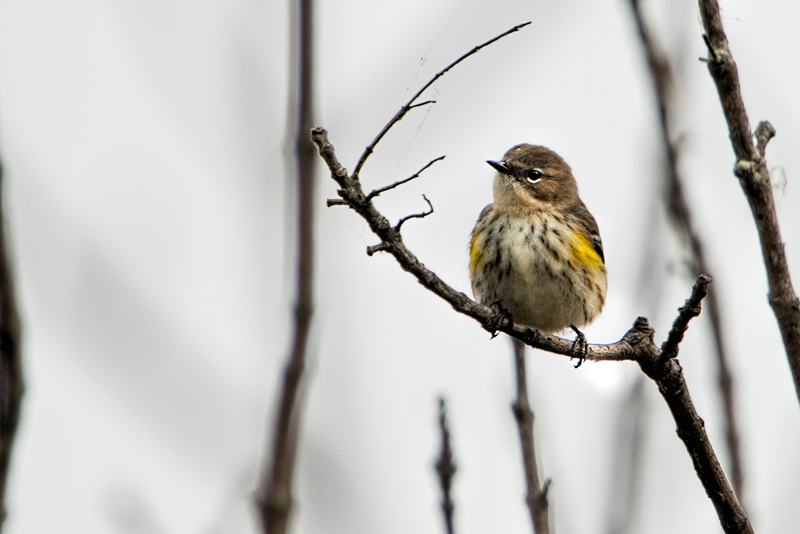 Above and below are a few images of a Yellow-rumped Warbler that I photographed at Occoquan National Wildlife Refuge. Warblers do not stay in one place but for a second or two. As they search for insects, they are constantly on the move. Therefore, they can be challenging to photograph. I was in the right place at the right time and prepared, as this warbler searched a tree for food. 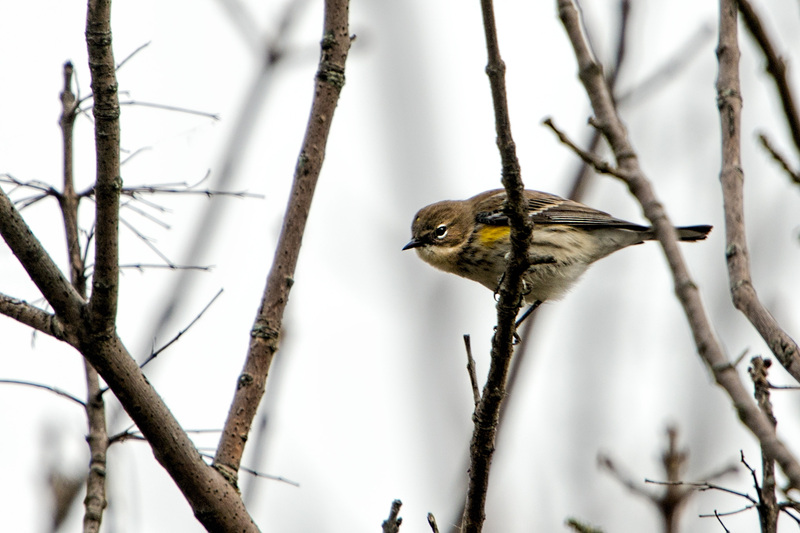 In the above image, the warbler spotted an insect and was just about to leap from the branch and out of sight. I am planning a trip to Chincoteague National Wildlife Refuge and hope to see and photograph some migrating ducks and snow geese, and will be posting a new article soon. 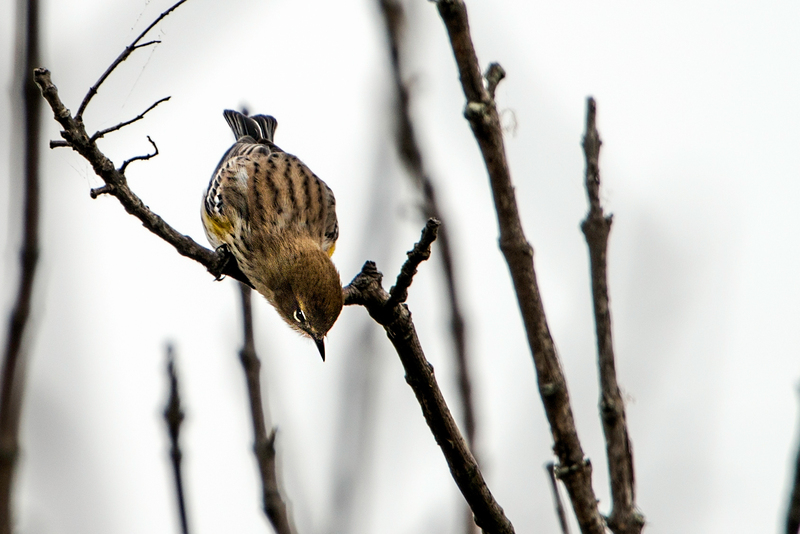 This entry was posted in Bird Photographs, Nature, Wildlife and tagged Barred owl, Yellow-rumped Warbler. Bookmark the permalink. Very nice. Shooting the yellow rumps was fun. Apparently they are about all gone now – time for some winter birds. Cool read and I love the Barred Owl, my favorite Owl with a great personality! I have been slacking! I have three articles I have started and I need to finish! Love the photo of the Barred Owl. Such a magnificent bird! 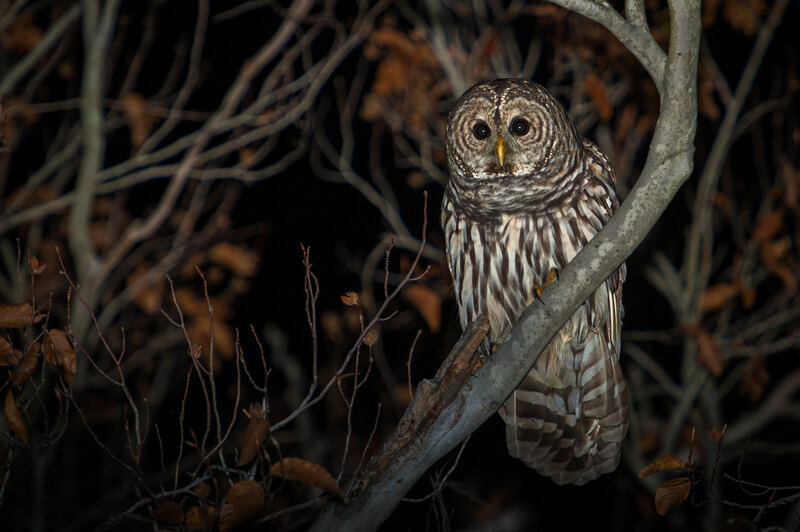 Great photo of the Barred Owl especially with the foliage and it being taken at night! This guy looks familiar but still remarkable. A couple of great subjects! I love seeing feather patterns and these are full of detail! The theme is one of WordPress’s standard themes. encourage you continue your great job, have a nice evening!